ALL ENTRIES SHALL CONFORM TO THE STRICTER OF THESE DEFINITIONS FOR ACCEPTANCES TO BE VALIDATED BY THE INTERNATIONAL ORGANIZATIONS GRANTING RECOGNITION OR PATRONAGE. NATURE PHOTOGRAPHY is restricted to the use of the photographic process to depict all branches of natural history, except anthropology and archeology, in such a fashion that a well-informed person will be able to identify the subject material and certify its honest presentation. • The story telling value of a photograph must be weighed more than the pictorial quality while maintaining high technical quality. • Human elements shall not be present, except where those human elements are integral parts of the nature story such as nature subjects, like barn owls or storks, adapted to an environment modified by humans, or where those human elements are in situations depicting natural forces, like hurricanes or tidal waves. • Scientific bands, scientific tags or radio collars on wild animals are permissible. • Photographs of human created hybrid plants, cultivated plants, feral animals, domestic animals, or mounted specimens are ineligible, as is any form of manipulation that alters the truth of the photographic statement. No techniques that add, relocate, replace, or remove pictorial elements except by cropping are permitted. • Techniques that enhance the presentation of the photograph without changing the nature story or the pictorial content, or without altering the content of the original scene, are permitted including HDR, focus stacking and dodging/burning. • Techniques that remove elements added by the camera, such as dust spots, digital noise, and film scratches, are allowed. • Stitched images are not permitted. • All images must appear natural. • Color images can be converted to greyscale monochrome. • Infrared images, either direct-captures or derivations, are not allowed. • Images entered in Nature sections meeting the Nature Photography Definition above can have landscapes, geologic formations, weather phenomena, and extant organisms as the primary subject matter. This includes images taken with subjects in controlled conditions, such as zoos, game farms, botanical gardens, aquariums and any enclosure where the subjects are totally dependent on man for food. Images entered in Wildlife sections meeting the Nature Photography Definition above are further defined as one or more extant zoological or botanical organisms free and unrestrained in a natural or adopted habitat. • Landscapes, geologic formations, photographs of zoo or game farm animals, or of any extant zoological or botanical species taken under controlled conditions are not eligible in Wildlife sections. • Wildlife is not limited to mammals, birds and insects. Marine subjects and botanical subjects (including fungi and algae) taken in the wild are suitable wildlife subjects, as are carcasses of extant species. FIAP MONOCHROME DEFINITION - A black and white work fitting from the very dark grey (black) to the very clear grey (white) is a monochrome work with the various shades of grey. A black and white work toned entirely in a single colour will remain a monochrome work able to stand in the black and white category; such a work can be reproduced in black and white in the catalogue of a salon under FIAP Patronage. On the other hand a black and white work modified by a partial toning or by the addition of one colour becomes a colour work (polychrome) to stand in the colour category; such a work requires colour reproduction in the catalogue of a salon under FIAP Patronage. PSA MONOCHROME DEFINITION – An image is considered to be Monochrome only if it gives the impression of having no color (i.e. contains only shades of gray which can include pure black and pure white) OR it gives the impression of being a greyscale image that has been toned in one color across the entire image. (For example by Sepia, red, gold, etc.) A greyscale or multi-colored image modified or giving the impression of having been modified by partial toning, multi-toning or by the inclusion of spot coloring does not meet the definition of monochrome and shall be classified as a Color Work. PSA CONDITIONS OF ENTRY (ALL SECTIONS) - The exhibition is open to anyone; however, an entry may be rejected when the sponsoring organization or its agent, in its reasonable discretion, believes the entry does not conform to the exhibition rules and conditions. An entrant’s images will not be presented to the judges consecutively. An entrant’s four images will be distributed throughout four rounds of judging in that section. Distribution of images shall be in the same round order as submitted by the entrant. Entries must originate as photographs (image-captures of objects via light sensitivity) made by the entrant on photographic emulsion or acquired digitally. By virtue of submitting an entry, the entrant certifies the work as his own (aliases are not permitted). The entrant permits the sponsors to reproduce all or part of the entered material free of charge for publication and/or display in media related to the exhibition. This may include low resolution posting on a website. Note: Entrants who indicate that their images may not be reproduced or used “will not be eligible for awards” or inclusion in audio-visuals of the exhibition “and could be subject to disqualification” by the exhibition sponsors. iii. PSA members working on Galaxy and Diamond Star Ratings shall be allowed to continue using different titles of monochrome versions and color versions of the same capture that have already been accepted until the required number of acceptances for those titles have been completed. Words such as “Untitled” and “No Title” are not acceptable as part or all of an image’s title, nor are camera capture filenames. An image may be entered in only one section where acceptances of that image in multiple sections would be eligible for the same star path. The entrant must sign the entry submittal form in the space provided to verify authorization for the exhibition to destroy the exhibitor’s prints in lieu of returning them otherwise the full entry fee shall apply if the exhibition does have separate fees for return of prints and non-return of prints. All acceptance eligibility shall be in accordance with the PID Star Ratings or the Galaxy/Diamond Ratings requirements as appropriate. 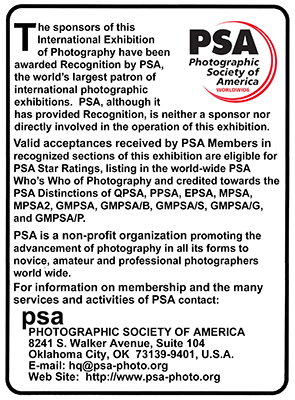 PSA - If at any time, it is determined in the reasonable discretion of the exhibition organizer or the judges before, during, or after the judging of an exhibition that an entrant has submitted entries where one or more images may fail to comply with these Conditions of Entry, including the stated definitions, the exhibition organizers reserve the right to delete the entry from the exhibition and void any or all acceptances or awards in connection with the exhibition. Fees may be forfeited or refunded in these circumstances. The entrant acknowledges that the decision of the exhibition organizers or the judges is final. FIAP - Each entrant to FIAP salons must observe the rules of FIAP. Each author whose image shows any suspicions about the compliance with FIAP regulations or definitions can be requested by the organiser or by FIAP, to submit the original file (file containing the data recorded by the sensor, if so, the RAW file) plus the file of the image immediately before and immediately following the questionable image. If he/she failed to provide what is required, he can be sanctioned. The names of sanctioned entrants are put on a list, which is sent to the organisers of FIAP salons. Their participation in any event of FIAP is restricted or banned depending on the case. Neither can they be appointed as judges of FIAP salons, nor participate in a salon under FIAP patronage, nor organise a salon with FIAP patronage, nor apply for FIAP distinctions and they lose the right to use FIAP distinctions they have formerly received. IMPORTANT: Concerning digital entries, FIAP recommends that authors should preserve intact, with no alteration, the original metadata of images. In case of contestation for incompliance with FIAP regulations the fact of not being able to access this important data could mean that the author could be sanctioned. Persons who are found guilty of plagiarism are excluded lifelong from FIAP activities. Salon chairmen, persons closely involved in the organisation of the salon and persons in charge of the handling of the salon software are not allowed to participate in the salon. 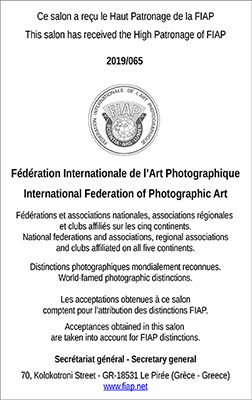 By the sole act of submitting his/her images or files to a salon under FIAP Patronage, the entrant accepts without exception and with no objection the following terms: - that the submitted images can be investigated by FIAP to establish if these obey to FIAP regulations and definitions even if the entrant is not a member of FIAP, that FIAP will use any means at its disposal for this undertaking, - that any refusal to cooperate with FIAP or any refusal to submit the original files as captured by the camera, or failure to provide sufficient evidence, will be sanctioned by FIAP, - that in case of sanctions following the non-compliance with FIAP regulations, the name of the entrant will be released in any form useful to inform the breaches of the rules. As mentioned in II.2) it is recommended to leave the EXIF data in the submitted files intact in order to ease eventual investigations.